Jus t getting started looking at OCC information. Found the API number. I am trying to figure out what Camino has projected the amount of Gas from this well, if there are any projections. We signed an easement for a 20in gas pipeline. I will note that is is a short easement, only about 200 ft, yet Iron Horse wanted a 75 ft easement with a much wider construction easement. I understood the construction easement as I am a consulting civil engineer. However, with access to both ends of the short easement I only allowed a 15ft permanent easement. A friend who was a pipeline welder back when was telling me that the 20in pipeline meant that they expect a lot of production from that well. My thinking is that they are planning on extending this across the section if this well produces ok. Also, North of Pocassett at the pipeline staging area, there must be 100 miles of new 20in pipe stacked up. Do you have a section/township/range? The API has the state (35) and the county (051) embedded in it, but then the numbers are sequential, so no S-T-R embedded. The Commerce Comet 0707 11-2-1WH extends over section 2 and 11, but very short in 11 and it spud 11/22/18. The November 2-11-1XH extends over the full length of 2 & 11. It only has a permit at this point. There may be more than those two wells in the section eventually, so always think bigger and longer time frame, hence need for larger pipeline. 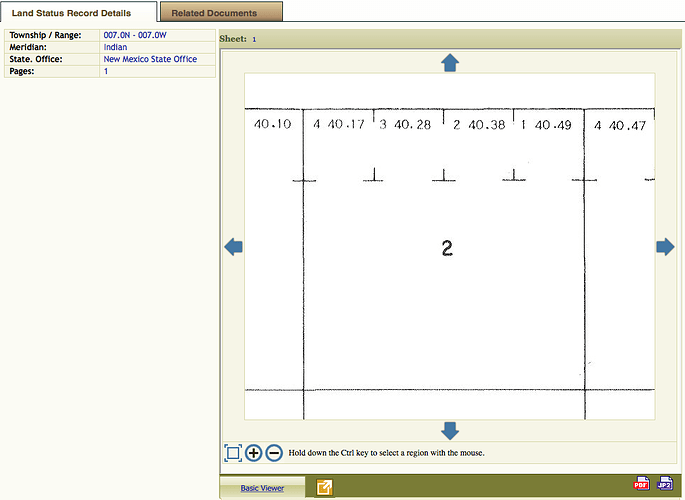 Thanks for the info… I own the land over it in 11, and the E/2 SE/4 & the E/2 W/2 SE/4 of 2. I have 1/2 of the minerals , and would like to figure the portion I would receive from the well. We have a 20% royalty. How much area does the horizontal well pull from? I really want to thank you and the other experts on the forum. I know this takes a lot of time to answer these questions. The forum members are very fortunate to have your experience available. You will not get any royalties from the surface rights. However, if they decide to build a pad on your surface, you can negotiate a surface lease which will give you damages for the land used. Recommend getting an attorney to help you with that. Each section is 640 acres (most of them). The northern tier and the western tier often have adjustments for the curvature of the earth. You can look the maps up on Search - BLM GLO Records OK is an LSR state, so use that option. Here is your section 2. Each quarter section is roughly 160 acres, so the E/2 of the SE4 is 80 acres and the E/2 W/2 SE/4 is 40 acres. (Hint: read the legal description from right to left) The gross acres you might have would be 120 acres, but you own 1/2 half, so you have 60 net acres. The equation for royalties for a well is: net acres /spacing acres (actual) x royalty x % perforations in your section. If the well is over two sections, then after the well is drilled, the survey of the borehole will be reported to the OCC and they will determined the splits between the two sections. In your case, if you do not have any mineral acres in 11, then you will only get the split from section 2. In your case, you have acreage in the SE4 which is regular. But look at the northern part of the section. With more than 40 acres in those “lots”, the total acreage is a wee bit more than 640 acres. 641.32 acres. Hence the equation will be 60/641.32 x .20 x .50 for the moment. Will depend upon the final splits. 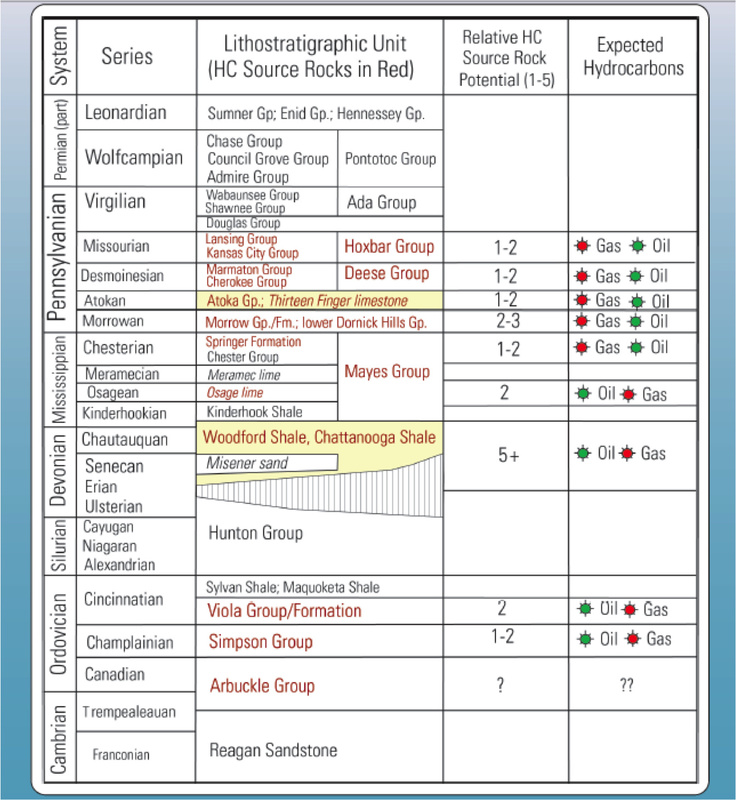 Here is a stratigraphic column that will help you visualize. The “adjacent” is used in a horizontal sense. If the well is planned for the Woodford, they drill straight down through all the layers above the planned zone, then they turn the well at about a 90 degree angle. That takes about a 1/4 mile or so. Then the try to stay horizontal. They may accidentally wander into the zone above (Miss) or below (Hunton), so they have to get the permit for all three. If you can visualize a wine rack. They are trying to drill a set of wells into the Woodford that will lay side by side in that zone. Now visualize a set of bendy straws. The vertical part of the hole is going straight down, then turns at an angle and then lands and goes along the Woodford zone for a mile or more. The next one comes in some distance away and does the same thing. The surface location is in basically the center of Section 11. The bottom hole is essentially at the north end of Section 2. Imagine the Sections being comprised of 4, laydown, 320 acre parcels. 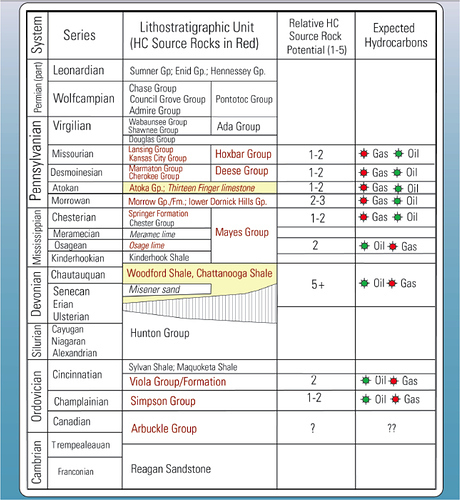 The wellbore will traverse 3 of those 320 units, 2 in Section 2 and 1 in Section 11. Hence, 2/3rd or 66% in Section 2 and 1/3rd or 33% in Section 11. The well probably won’t drain very much of the section, but them placing it that close to the eastern border hints at room for several more in the future. The well is Commerce Comet 0707 11-2-1WH in 11 (and 2) 7N-7W. Always helpful if you give the S-T-R which helps out everyone else who is curious. The well spud in late November, so the completion report may not be out until four months or so after the well has been completed. It takes about four-five months to drill and complete a two section well. Late November spud, so maybe March or April before it is finished. You can find the “active” date on the OK Gross Production site which is a clue to first sales. I usually start with the bottom hole and work up. I just looked and the well is not listed yet, so no completion has been reported. The pipeline is probably a month away from getting to the well. No, don’t get paid for the flared gas. Like whiskey making, where a percentage of barrel aged spirits are lost to evaporation, they call this the ‘angels share’ LOL. Mike, an Angel’s share would be Appropriate. Like Day Trading on the Exchanges : when the price is Up is Great but what Happens when the price is Down ? Ever wonder what happened or where the money went ? OK, they already have their angel’s share. I know about that in whiskey making as I toured the Labrot & Graham distillery and barrel house!!! Interesting note, in case of fire, the alarm system notifies the fire department and ATF!!! What gripes me the most is when the drilling rig left, so did my 1950 Dempster windmill. Pulled down with a telehandler and gone… We found the tracks… However getting them to pay for it …Guess I will call that the Devil’s share!! !